Mr. V, 62 years old Engineer from Karnataka was an anxious, determined, short tempered, reserved and dominating personality. He developed depression after the demise of his father in 1990. He was treated for the same in Mysore. One year later his symptom progressed to anxiety, dominated by obsessive and compulsive symptoms, which gradually increased in severity. He had taken voluntary retirement and had not been working since past 15 years. He was also unable to withdraw his pension, as he could not sign for himself. His obsessive symptoms included insisting on repeated checking and verifying documents, cheques and money. His compulsions included repeated washing of the hands (about 80-100 times at the time of admission) spending long time in the toilet (about 3-4hrs) repeatedly asking the same questions and verifying the answers multiple times. There were no ideas of reference on persecution. There were no hallucinations. Since the last two years he had been confined to home due to these symptoms. His disease had significantly affected his and his caregiver’s quality of life. He had been on SSRIs and SDAs, including Fluoxetine, Fluvoxamine, Sertraline, Clomipramine, Escitalopram and many others in maximum doses. He had also undergone behavioral therapy during these 15 years (more than 20 outpatient sessions) under the care of psychiatrist without any significant change in his symptoms. At the time of admission he was on a daily dose of Risperidone 2mg, Quetiapine 75mg, Alprzolam 5mg, Escitalopram 10 mg and Fluoxetine 100mg. The referring psychiatrist and the psychiatrist who independently assessed him for surgery both were satisfied with the duration of the treatment (medical and behavioural therapy) and had found to be adequate to establish intractability. On examination He was intelligent, anxious, well oriented and had normal memory. He had preserved insight, co-operative and repetitive. His thought process had occasional tangentially, but can be brought back to rational thinking. He had no other focal neurological deficits. He was evaluated by two psychiatrists independently, who established the diagnosis of OCD as per DSM IV criteria. The neurosurgeon (author) also concurred with them and decided to offer surgical option. He underwent neuro-psychological testing that included Minnesota multiphasic personality inventory and RORSCHACH. The MMPI revealed “Fake Bad” protocol/psychoses. The F% was 66.67% implying weakening ties with realty. It was reported as obsessive compulsive personality disorder and psychoses. However, it was also noted that the patient was very defensive in taking the tests (and was also tired). His YBOCS was 38/40 and Hamilton depression score was 24. His Beck’s anxiety inventory reflected a score of 26 revealing moderate degree of anxiety. The Mini-Mental State Examination score was 30, revealing a normal cognitive profile. Based on the clinical history, patient interview and results of various assessments, the team of psychiatrists concluded that this was a case of intractable OCD and qualified for surgical intervention. There were two options available for surgery: DBS or ablative surgery(Lesion). Patient and his wife came from a city that was four hours’ drive from Bangalore (the closest town to have flight connections with Mumbai). They had not travelled independently in many years and felt that it would be difficult for them to make frequent visits to Mumbai for postoperative programing. Hence, they decided to opt for lesion. The case was than referred to the psychiatric surgery review board, which comprised of a neurosurgeon, neurologist and psychiatrist not involved in surgery or patient care. They found that the surgical treatment was a logical option for improving patients’ condition. As the patient could not sign (because of OCD) an informed consent was obtained from his sister and wife. Patient consent for surgery was recorded on video. A preoperative planning MRI was performed one day prior to surgery. IR and T2 weighted coronal images were used to identify the internal capsule. A surgical target 3 mm anterior to the posterior border of anterior commissure and 2 mm inferior to the AC-PC plane was selected. This was the bottom of the target. On the day of surgery, a stereotactic CT scan was performed and fused with the preoperative MRI. The target was approached through a precoronal burr hole under local anesthesia. Neuro physiological response was noted starting from 20mm above the target to 3mm below the target on right side and 15mm above till 3mm below the target on left side. The response in the form of decrease in anxiety, more calmness and pseudo smile were noted nearer the targets. Radiofrequency lesioning was done bilaterally at 75 degree Celsius for 60seconds. Post op CT scan confirmed appropriate target. He had good improvement in his OCD symptoms but had severe confusion and disorientation in the initial three postoperative days. He was also having high-grade fever and hypernatremia, for which no identifiable apparent cause. Reduction in the dosage of psychotropic medications was done on consultation with the Psychiatrist. At the time of discharge he had very good relief of his OCD symptoms. The YBOCS at the time of discharge (1 week postoperatively) was 9 and the depression score was 6. He had no anxiety. After three months of follow up the family reported that his obsession were as well controlled as after surgery, he had lesser anxiety and depression. The apathy has reduced. His progress and medical management is being done by the referring psychiatrist who has been keenly interested in the surgical option. Rodney King, a 51 years old gentleman, travelled from Australia to get his OCD and Depression treated at Jaslok Hospital by Dr. Paresh K. Doshi. Though Rod had started experiencing minor symptoms of OCD right from his teen age, his brother’s death in a car accident when he was 13 years old triggered the disease. He experienced intrusive images of people who were close to him being either injured or dead. He had concerns regarding cleanliness. He had unwanted thoughts of items being contaminated by germs. He washed his hands excessively and spent large amounts of time wiping down tables, door handles, stove knobs and other every-day items. He might wash the contents of his wallet because of concern that they were contaminated. He had difficulty going out in public. He repeated his movements and retraced his steps. If he experienced an intrusive thought whilst performing an action, he would make himself repeat the action. He exhibited checking behaviors, e.g. when driving he constantly checked in the rear vision mirror to make sure that he had not hit anyone. After throwing out rubbish, he had to re-check to make sure he had not thrown out anything valuable. When shopping, he spent large periods of time deciding what to buy, even when considering mundane items. He exhibited counting phenomena, e.g. He counted letters in people’s names or the number of windows in buildings. His excessive hand washing had resulted in him causing scars to his hands because of the methylated spirits he had used. These symptoms took up the majority of his day and interfered with his everyday life. They had interfered severely in his ability to form relationships. As the disease progressed he started becoming more depressed. During the course of his illness he had tried virtually all the possible treatments available to control his disease. All drugs used to help him little (except Clomipramine) but they brought in intolerable side effects like gastric upset. Some of the drugs made him put on excessive weight because of which he is >150 Kg. today. He also tried around 40 ECTs (Electro-convulsive therapies) > 20 cognitive and behavioural therapy, transcranial magnetic stimulation and rTMS, with little and transient improvement. During this time he found out about the surgical option and went to Melbourne for getting operated. He was refused surgery and this shattered him. He bought a nail gun to perform lobotomy on himself. He also tried to commit suicide (six times) to get rid of his illness. He got married, and had one son, but the marriage did not last long enough and ended up in a bitter divorce. Presently he is unemployed and lives with his mother. 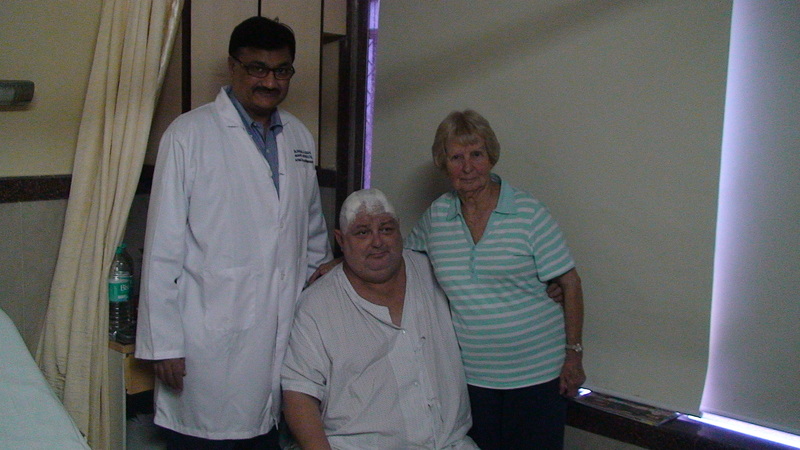 He found out about the surgery being offered by Dr. Paresh K. Doshi and approached him. After due deliberation with Rod’s psychiatrist and the local multidisciplinary team, Rod was offered surgery on the 18th December. He underwent anterior capsulotomy. During the surgery itself Rod found that his anxiety decreased, he felt bright, happier and his obtrusive thoughts became insignificant. He is now back with his mother and preparing to go back to Australia.